The East Canadian High Arctic (ECHA) population of Light-bellied Brent Goose breeds in Canada and winters almost entirely in Ireland, with smaller numbers in Britain, the Channel Islands and the north coasts of France and Spain. It undertakes one of the longest migrations of any Western Palearctic goose population, crossing the Greenland ice-cap, staging at sites in Greenland and Iceland before crossing the North Atlantic to Ireland. Strangford Lough in Northern Ireland hosts over 75% of the population during the late autumn and is now by far the most important site for this species outside the breeding season. Annual estimates of the population size, percentage of young (%) and mean brood size (young per successful pair) of East Canadian High Arctic Light-bellied Brent Goose, 2003/04-2017/18; recorded during the All-Ireland Light-bellied Brent Goose Census. The East Canadian High Arctic population of Light-bellied Brent Goose breeds in the eastern Queen Elizabeth Islands from eastern Melville Island to Devon Island and northern Ellesmere Island. Almost all of these geese winter in Ireland, with much smaller numbers reaching the west coast of Britain, the Channel Islands, and the north coasts of France and Spain. It undertakes one of the longest migrations of any Western Palearctic goose population, crossing the Greenland ice-cap, staging at sites in Greenland and Iceland before crossing the North Atlantic to Ireland. Strangford Lough in Northern Ireland hosts over 75% of the population during the late autumn and is now by far the most important site. Lough Foyle, on the north coast, has also become increasingly important in recent years as a landfall site. As winter progresses, these geese disperse around the coast of Ireland, favouring sites in the northwest, east, southeast, southwest and west of the country with notably high numbers at Dublin Bay and Wexford Harbour and Slobs. Over 3,000 also disperse thinly along the rocky coastlines of Ireland in the late winter (Robinson et al. 2004). It has been suggested that Light-bellied Brent Geese may have relied almost entirely on Zostera during the winter, before a wasting disease caused almost the entire depletion of Zostera in Ireland during the 1930s. Since then, the diet in estuarine and saltmarsh areas has become more cosmopolitan, including algal foods such as Enteromorpha and Ulva, and saltmarsh plants such as Festuca and Puccinella. Inland feeding was first recorded in Ireland and Iceland during the mid 1970s. Feeding on grasslands has increased steadily since then, especially in east and southeast Ireland, with 25% of the population spending a large proportion of its time foraging on managed grasslands. In a few areas, most notably Wexford Slobs, Dungarvan Harbour and Strangford Lough, Light-bellied Brent Geese feed on cereal crops, both waste in autumn stubbles and spring seed, and waste potatoes. Although these food types remain available in early spring, most birds return to the saltmarshes at this time to exploit fresh growth of more natural foods prior to spring migration (Robinson et al. 2004). Robinson, J.A., K. Colhoun, G.A. Gudmundsson, D. Boertmann, O.J. Merne, M. O’Briain, A.A. Portig, K. Mackie & H. Boyd. 2004. Light-bellied Brent Goose Branta bernicla hrota (East Canadian High Arctic population) in Canada, Ireland, Iceland, France, Greenland, Scotland, Wales, England, the Channel Islands and Spain 1960/61 – 1999/2000. Waterbird Review Series, The Wildfowl & Wetlands Trust/Joint Nature Conservation Committee, Slimbridge. 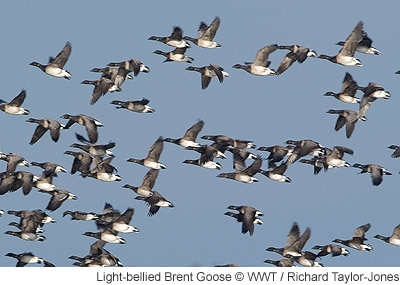 A complete census of the ECHA Light Bellied Brent Goose population is undertaken twice a year, one in autumn and one in spring. Counters record the number of geese present and the age structure of flocks. The census is organised by the Irish Brent Goose Research Group. Results from the census are summarised on the ‘Latest results’ tab. In autumn 2017, the 22nd coordinated count of the East Atlantic High Arctic population of Light-bellied Brent Goose was organised by the Irish Brent Goose Research Group. 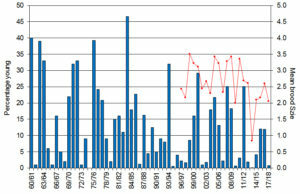 Counts were undertaken in Iceland, Ireland, Britain and France, with good coverage of all major sites achieved. A total of 35,042 geese was recorded, which is 4.8% lower than in 2016 (36,811 birds) (Figure 1). The majority of birds at the time of the census were in Ireland (34,164), with the largest concentration recorded at Strangford Lough, Northern Ireland (26,635). Surveys in Iceland recorded a total of 619 geese, with the remainder of the population (259 birds) in Britain and France. Figure 1. Annual census-derived estimates of Canadian Light-bellied Brent Goose population size, 1961–2017. 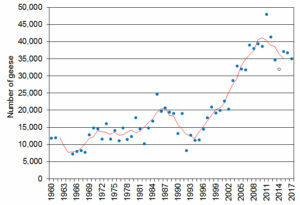 Five-year running mean shown as red line (e.g. mean for 2011 is from population estimates for 2009–2013). The open circle in 2014 represents a likely undercount due to a lack of coverage in Iceland. Age assessments collected in 2017/18 suggest that the Canadian Light-bellied Brent Geese had a poor breeding season in 2017. A sample of 17,184 geese were aged, representing 49% of the 2017 population estimate, of which only 140 (0.8%) were identified as young birds (Figure 2). This is considerably lower than the previous ten-year mean (10.2 % for 2007/08–2016/17) and amongst the lowest recorded since records began. The mean brood size was, however, only slightly lower than the previous ten-year average (2.50 0.25 for 2007/08–2016/17) with 2.05 young per successful pair recorded for the 60 broods assessed (Figure 2). Figure 2. The percentage of young (blue columns) and mean brood size (red circles) of Canadian Light-bellied Brent Geese, 1960/61–2017/18. 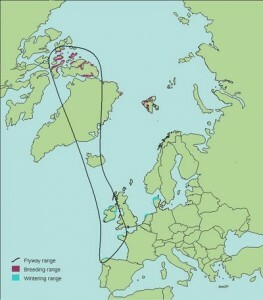 Colour-marking of this population began in 2001 and is overseen by the Irish Brent Goose Research Group. A large number of birds are currently colour-marked with engraved rings on each leg, and this underpins a range of detailed scientific studies also being carried out on this small, but increasing, population. Further details about this work can be found here.